As we move into the new year and new world order we are focused on social action and social entrepreneurship. Not a new idea to me or to the world, just more urgent feeling, at least for me. I have been journaling for several weeks now and this is all emerging as a result of that work and a course on social entrepreneurship that I have been participating in. Social Responsibility has always been on my values statement along with environment. But I haven’t had a solid plan for how it happened or what it looked like. In reviewing my vision for Compass Rose Consulting and our direction this year, it had to focus on the world and being a catalyst for change and improvement in some way. At the same time, I didn’t want to start a new business or create something totally different from what I have been doing. Business coaching/consulting, work with non-profits, leadership development, marketing, meeting facilitation and team building — I am good at. I wanted to take what I have and make it work for me and for clients in a new and inspiring way. You can see that I have totally shifted my brand colors to Gold and Purple. Very intentional. They are colors that represented strong women throughout the Suffragist Movement for women’s right to vote. They represent strength for me and commitment. As I was putting together our strategies and model I also came up with this image. It boils it down to simple. Giving Support is our next strategy. 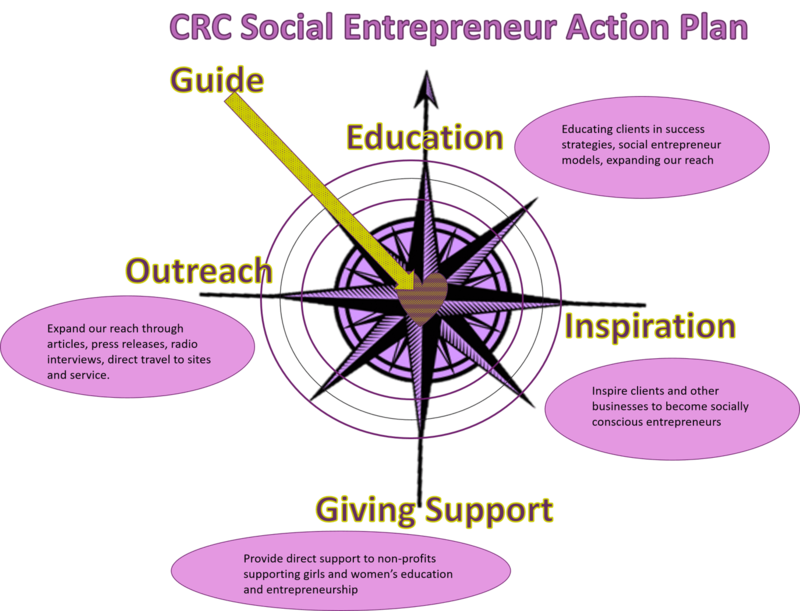 Compass Rose Consulting’s plan is to provide support via non-profits to women entrepreneur’s. We are doing this in a couple of different ways — first is through a scholarship fund to the Women’s Business Circle, to support women in need on their entrepreneurial journey. We have also identified three non-profits that work directly with women entrepreneurs that we will provide funding to, from our profits. Social Entrepreneurship does not mean that you are not making money. Developing a thriving business is a key to making it personally and then being able to support other people on their journey. Our plan is to use part of our profits– money after expenses to support these different ventures. Because I wanted a global reach — we are supporting micro-loan programs for women that provide loans in this country and internationally. Outreach- Women’s Business Circle ties it all together really. We will be doing outreach in several different ways. First, through articles and press releases, we will be able to reach out beyond the Compass Rose Consulting community. My next book will also focus on this — social entrepreneurship and its impact on the people doing it as well as the people it reaches. We also plan to do retreats and service throughout the programs… more ways for people to be involved but more importantly is that they are ways for people to touch other people’s lives. It is through this heart to heart connection that real change can happen, because it starts happening on a personal level for each person and then moves out from there. Again, a cascade. Outreach leads back to education and the cycle begins again. You also see the heart at the center of the compass. This is a new part of our logo. The center of the compass is called the compass rose. Thus the name Compass Rose Consulting. The compass rose is what is found on maps to help you orient the map. It is also the center of the compass — which helps you find your direction. At the center of our compass I have added the heart because it is what should be guiding our direction. We should move in business with heart, with compassion. We have core values to help guide our decision making and they all matter, but at the center is our core purpose and the core of business — the heart. The new rings around the compass are symbolic as well. They represent the cascades of outreach. They are diverse in color, because the world is diverse. We treasure that diversity. And the outer ring is the newest — green to represent the earth and our need for commitment to operating our businesses in earth loving ways. I have also used the different colors in the to represent the different levels of service, so they each have multiple meanings and metaphors…. It is exciting to move Compass Rose Consulting forward in this new way.